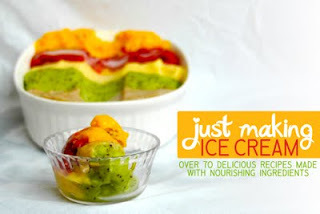 Just Making Ice Cream ebook Giveaway! If you love ice cream as much as I do but feel guilty everytime you eat it, stop worrying! There's a new ebook that talks about why we should make our own ice cream and how to do it with whole foods ingredients that are much better for our health! My friend, Wardeh @ GNOWFGLINS is hosting a giveaway for an awesome new ebook about making your own ice cream! She's sponsoring this giveaway for a missionary friend and I'd like to send you over to Wardeh's blog to learn more. Lot's more! Beautiful photographs and sample pages from the ebook! But hurry! The giveaway and special price offer ends on Thursday, Sept. 1st. Ebooks can be purchased at the reasonable price of $12 anytime after the giveaway ends. Here's a little text from GNOWFGLINS about the author and her family's ministry to spread the gospel of Jesus Christ. You'd be supporting their youth ministry if you purchase the ebook. “I am a wife to 1 amazing man, a mama of 3 beautiful kids and a missionary in Honduras. We are currently living on 6 and a half acres of land surrounded by gorgeous pines and mountains, starting up our ministry Rancho Oasis for Youth. Who’s the incredible cook and photographer behind this marvelous ebook? My good friend Marillyn Beard from Just Making Noise. She, her husband Jon and their three children live in Honduras as missionaries for youth (visit the Rancho Oasis for Youth website). Here are a few words from Mare about her life and family’s ministry. "I’ve been writing my blog, Just Making Noise: Sound Bites From a Deaf Mama, since 2009 because I love to share my passions for healthy food, wholesome lifestyle and photography. I also love to make healthy sweets (especially ice cream!) and try to cook almost everything I can from scratch. Go on over to GNOWFGLINS and enter the giveaway or purchase the ebook from the links here or @ the giveaway. Either way all your ebook costs go directly to support their ministry. Holistic Healing, Herbalism, Ayurveda, Traditional Chinese Medicine, Balance, Native American Medicine, Ancient European Medicine ~ what do they mean? What do they have in common and how do they differ? There are countless books that deal with these questions so I'll just leave you to find the answers. Let's just say that these and many other cultures have influenced Western Herbalism. "I believe we, as Christians, can use all that God has created for our health to His glory if we are able to separate the method from opposing belief systems. Of course, we have to take into account the image we are giving to others and be open about where our faith lies. If what we're practicing becomes a stumbling block to someone influenced by our actions, it's time to reconsider our approach." The line becomes blurry when wisdom and religious practices interact. Can we follow the wisdom without being influenced by the spiritual practices? Maybe the question could be rephrased. Can we follow the healing wisdom of other cultures and maintain our right relationship with the God of the Bible? I think through diligent prayer and proper focus on the Creator of all things, we can. But, I don't think this is true for everyone. Now I'm talking in circles, right? The reason I say that is because we may be able to participate in a healing practice without even considering an opposing religious view that might have a negative affect on our faith or to effectively separate the two. But another believer may not. Or more importantly, an unbeliever. The Bible is very clear about not being responsible for leading some one down a path that would draw them away from God. There are so many different views on using foods and plants, energy and mantras (could we substitute prayer or a hymn or a praise? ), manipulation and chi, and the list goes on, that I think we'd be foolish and not very good stewards if we were too quick to "throw the baby out with the bath water", so to speak, by completely avoiding the wisdom of other cultures. Once an alternative practice is examined, it often becomes clear that it is effective, not because of the spiritual rituals included in it but because of the way our bodies are designed to work. So we can use these things to heal our temple to God's glory. It kinda reminds me of the story of the talents. If we stick our heads in the sand rather than stand firm in our convictions, we're missing out on multiplying the gifts we've been given to further the kingdom. Have you heard of Rootstalk? If you love all things herbal, you'll want to attend. This event is hosted by Mountain Rose Herbs and will benefit the Cascadia Wildlands. Go to the Roostalk site @ http://www.rootstalkfest.com/ to learn more. Enter the Rootstalk/Poppy Swap Giveaway to win some great prizes.